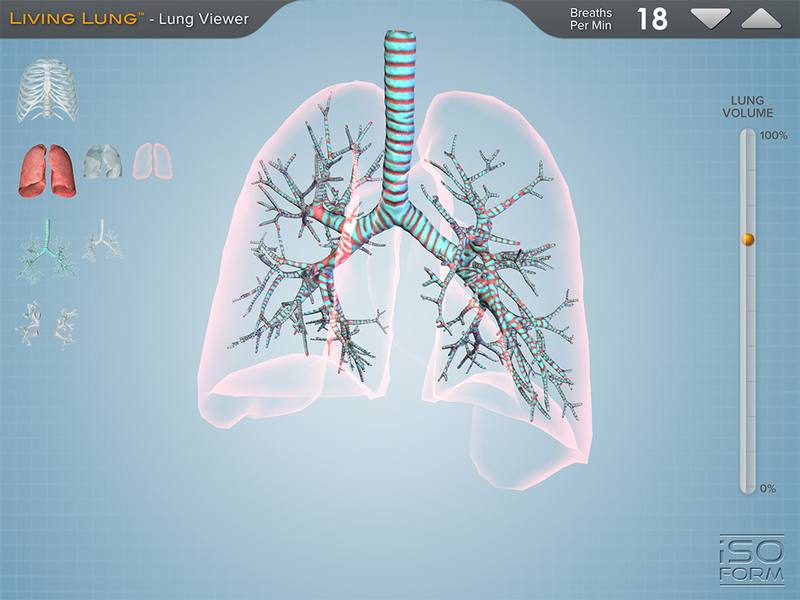 The Living Lung™ app is compatible with the iPad 2 or newer. Due to extremely high-resolution models and textures, this app is not compatible with the first generation iPads. 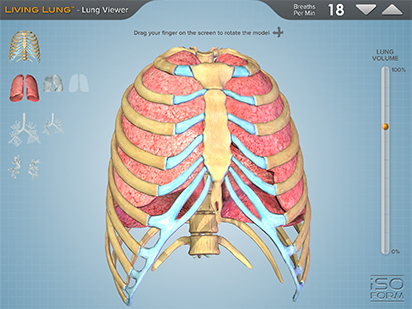 The Living Lung™ is a real-time 3D medical education and patient communication tool, featuring incredibly detailed anatomical respiratory models. It is a member of a series of apps developed specifically for the iPad by a team of anatomists, certified medical illustrators, animators, and programmers using actual human CT imaging data, and the most accurate 3D modeling technology available. The Living Lung™ is appropriate for use by secondary students, undergraduate and graduate students, and medical professionals. Interaction with the Living Lung™ utilizes true real-time 3D.  Unlike some other anatomical apps and programs, there are no pre-rendered frames or animations. Therefore, the user can place the incredibly detailed lungs, rib cage, and associated structures in any position and zoom in to any location to explore the anatomical features. 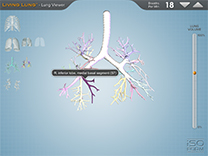 Animated transparent structures aid in the exploration of the bronchi and related key vascular components. Bronchopulmonary segments can be highlighted and labeled on the lungs and the bronchopulmonary tree. 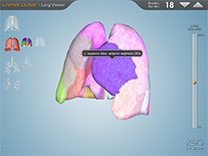 By selecting the views menu, the user can explore the anatomy of the lungs and associated structures by using a series of optional views. 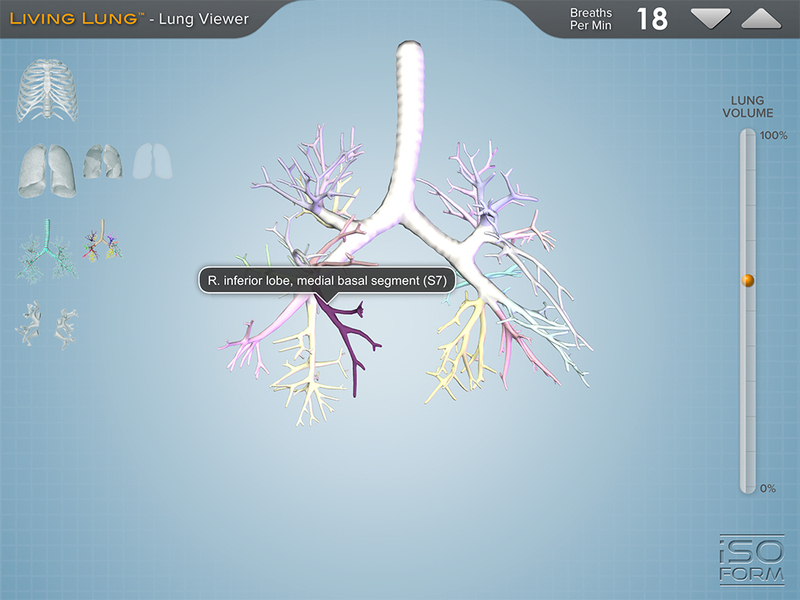 Color-coded, didactic models help to show the specific locations of lung segments, the internal bronchial tree, and circulatory structures. By increasing or decreasing the breaths per minute, the user can observe the change in the lung volume. The results of the user interaction are shown in an accurate increase of decrease in the motion of the ribcage, inflation and deflation of the lungs and the associated internal structures. A lung volume meter shows the increased or decreased lung volume associated with the breaths per minute change. 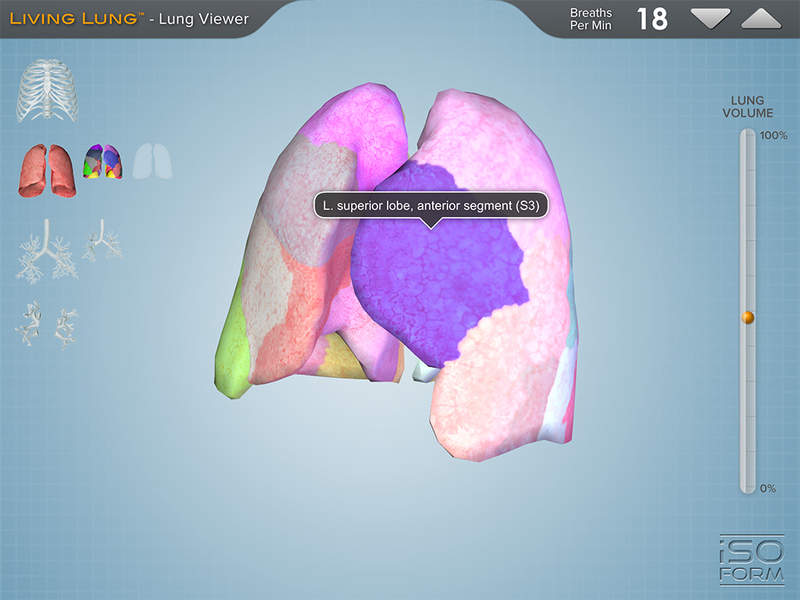 By selecting the color-coded segments of the bronchopulmonary tree, the user can study the names of the lung segments. The labels remain on screen and in the exact anatomical location during all real time 3D user interaction.